Background: The use of a customized immobilization thermoplastic mask is essential to compute clinical target volume (CTV) to planning target volume (PTV) margins. Purpose: The purpose of this study was to audit setup reproducibility in head and neck cancers (HNCs) since commencing an intensity modulated radiotherapy (IMRT) program. Patients and Methods: Patients for IMRT of HNC were immobilized using either a plain "S" type mask ("S") or with a customized reenforced support at nasion and chin ("S"-NC) or an extended "U" type mask ("U"- NC), for head (H) and neck (N) regions, following radiotherapy planning contrast-enhanced computed tomography scans used to generate digital reconstructed radiographs (DRRs) at 0° (anteroposterior [A-P]) and 270° (lateral) on which match structures were contoured. Orthogonal MV portal images (PIs), A-P, and lateral were obtained. PIs were matched with the DRRs to obtain the setup variations, and the systemic (∑) and random errors (σ) to calculate PTV margins using the van Herk formula (2.5∑ +0.7σ). Results: Thirty-three patients provided 226 paired PIs with matching done separately for HNC regions. PTV margins for mediolateral, A-P, and craniocaudal directions for the head region were 3, 4, and 5 mm for "S"; 3, 4, and 3 mm for "S"-NC; and 3, 2, and 2 mm for extended "U"- NC type masks, respectively. For neck region, PTV margins were 4, 8, and 5 mm for "S"; 3, 5, and 3 mm for "S"-NC; and 4, 5, and 2 mm for extended "U"- NC type masks. Conclusions: These audits provide the necessary confidence to decrease population-based CTV to PTV margins. Conformal and intensity-modulated radiotherapy (IMRT) techniques often employ multiple beam trajectories, both coplanar and noncoplanar, and depend on sharp gradients to spare adjacent normal structures while meeting treatment objectives, often employing the minimum possible clinical target volume (CTV) to planning target volume (PTV) margins with a view to decrease normal tissue morbidity. These treatment setups are, therefore, very sensitive to systematic and daily (random) setup uncertainties, the quantification of which permits the rational choice of the PTV margin used. PTV margins need to be individualized for each department as they vary across different machines and their parameters, are specific to immobilization devices with a different threshold for daily setup accuracies and also to an extent with each patient's compliance during a course of radiotherapy treatment. The use of portal imaging permits a population-based solution to the PTV margin used. Portal images (PIs) are matched with the digital reconstructed radiographs (DRRs) (generated using radiotherapy treatment planning contrast-enhanced computed tomography [CECT] scans), and the daily displacement is factored to compute PTV margins. 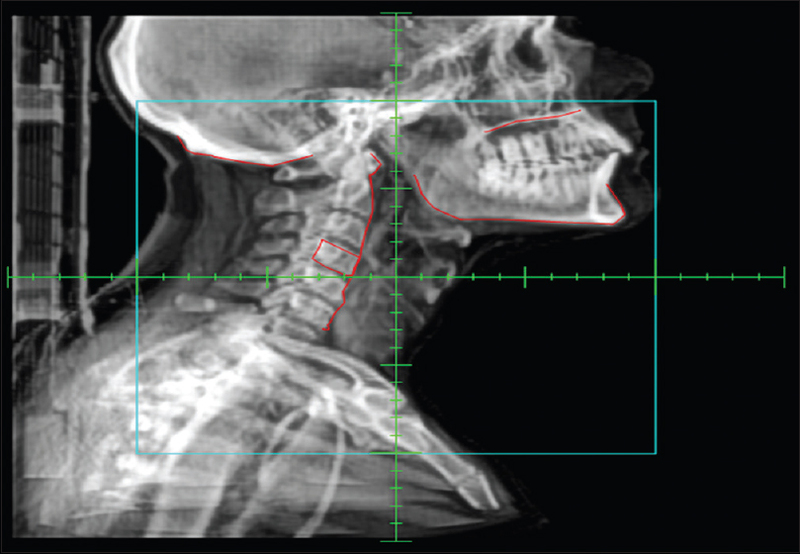 In the head and neck site, reduced PTV margins offer greater potential for parotid sparing. One step that improves the setup accuracy is better immobilization. 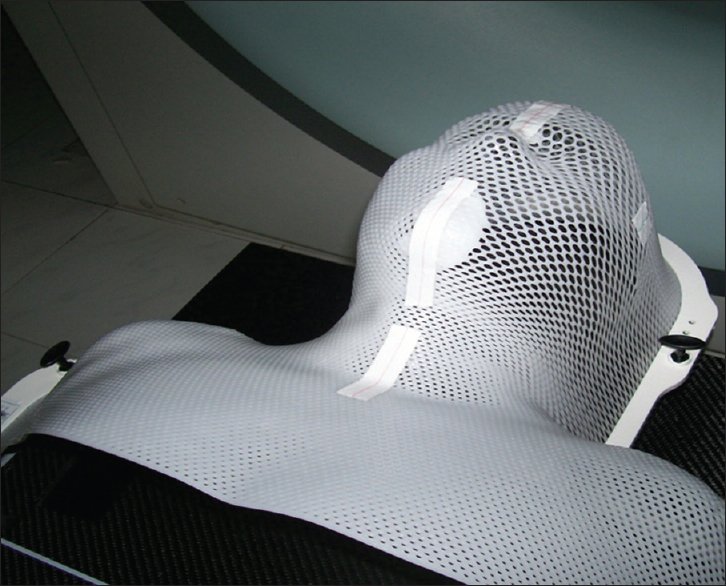 The IMRT program for head and neck cancer (HNC) patients was started in 2008, immobilizing the face, neck, and shoulder area of patients with an "S" plain mask ("S") and a generic 5 mm isotropic PTV margin based on published experience. In 2010, the in-house PTV margins were calculated as 8, 5, and 7 mm in craniocaudal (C-C), mediolateral (M-L), and anteroposterior (A-P) directions and changes introduced in practice. To reduce PTV margins, an in-house modification of mask was effected by applying extra thermoplastic bead reinforcements at the nasion (N) and chin (C) areas "S"-NC and applying similar modification to the extended "U" type mask ("U"- NC) in postoperative patients. A comparison of PTV margins using the plain "S," "S"-NC, and extended "U"- NC masks treated on one machine during 2011-2013 is presented as a series of audits which guided changes to PTV margins used in the department. All HNC patients (either definitive or operated) treated with IMRT using multileaf collimation on the linear accelerator by X-6MV beams were included in this study. All patients were immobilized using suitable neck rest, and one of the three different types of thermoplastic face masks was used. Neck rests were chosen based on the comfort of the individual patient and ensuring proper neck positioning. Choice of mask was based on either there was a need for immobilization of the shoulders (neck node level IV and supraclavicular fossa irradiation)-"S" type mask - plain ("S") or with a customized reenforced support at nasion and chin ("S"-NC) [Figure 1] or only up to mid neck was to be treated (such as operated situations that needed only radiation to the operative bed ± neck node level I/II/up to III)-an extended "U"- NC type mask was used [Figure 2]. After immobilization, radiotherapy planning CECT scan with 2-3 mm slice thickness was done in each patient. The data of which were then transferred to Eclipse ® treatment planning system for segmentation and planning. CTVs delineation was done according to the contouring guidelines. ,,, PTV expansion was 8 mm for C-C, 5 mm for M-L, and 7 mm for A-P directions (margin expansion values were taken from results of an earlier audit in the year 2011-unpublished data). Normal critical structures were contoured as the spinal cord, brain stem, and parotid glands. A 3 mm expansion was given around the spinal cord. This formed the planning organ-at-risk volume (PRV). After segmentation, IMRT solutions were generated using appropriate beams numbers, angles, and weighting (usually 7 beams, 51° apart). Radiation dose schedule was as follows - High-risk PTV was planned to receive 66 Gy in 30 fractions over 6 weeks at 2.2 Gy per fraction as definitive therapy or as 60 Gy in 30 fractions in postoperative patients. The low-risk PTV received 54 Gy in 30 fractions in both types of cases using simultaneous integrated boost techniques. All plans were analyzed and accepted by following ICRU report-62, i.e., 99% and 95% of target volume to be covered by 90% and 95% of prescribed dose, respectively, with dose homogeneity and not ≥1% and no volume receiving >107% and 110%, respectively, with critical structures dose limits, spinal cord/PRV ≤45/50 Gy, mean dose to parotid gland being not to exceed 26 Gy. For verification of the accuracy of treatment delivery, DRRs were generated for a fixed field size of 20 cm × 20 cm both anterior and lateral at 0° (A-P) and 270° (lateral), respectively. The structures to be matched were selected based on the region of interest (ROI) and visibility. For head as ROI - supraorbital ridge, lateral cranial skull borders, cranial border of maxilla and body of mandible were contoured on anterior DRR; caudal border of skull and body of mandible were drawn on lateral DRR. For neck region, styloid processes were drawn on anterior and body of second/third/fourth vertebrae while anterior margins of vertebrae from first to sixth were contoured on the lateral DRRs [Figure 3] and [Figure 4]. Orthogonal MV PIs, both anterior and lateral views were obtained before the radiation fraction of the day. PI protocol was for three consecutive days in the 1 st week of radiation, followed once-a-week for the remaining 5 weeks. For matching DRRs and PI, images were superimposed and best possible matching fine-tuned by manual alignment and aided initially by an "auto match" feature. The daily setup variations were measured as displacements between DRR and the PI of that day. The C-C displacement (y) was computed on both anterior and lateral imaging, while A-P (z) displacement was possible to compute only on lateral images only; likewise, M-L (x) displacement was possible to compute on anterior images only. These displacements were calculated specifically for each ROI (i.e., head and neck). Each individual displacement value is a combination of systemic and random errors. The systemic error for each individual patient is represented by the mean value of the displacements in that particular direction and for a particular ROI (i.e., head or neck region). The systemic error for these three groups (i.e., type of cast) of patients was computed by the standard deviation (SD; ∑) of these mean values of patients in each group. Random errors are represented by the dispersion of individual value around mean value, and one needs to compute the SD of random error per patient, square each separate SD (of patients treated with the same mask), then average them out and obtain the square root which will provide σ. PTV margins were generated using the van Herk formula (2.5∑ +0.7σ) for each direction and ROI for each group. Between January 2012 and July 2013, 33 patients of HNC treated by IMRT technique: 9 with plain "S" mask, 13 with customized "S"-NC mask, and 11 with extended "U"- NC mask. At least six paired PIs were taken during treatment, and therefore, there were 226 paired PIs for analysis. [Table 1] gives the overall systemic error (∑), random error (σ), and PTV margins for each group of patients. [Table 2] shows a comparison of PTV margins in the three directions using a different type of masks for head and neck region, respectively. The choice of a mask is determined by the regions to immobilize; the "S"/"S"- NC type chosen when surgical neck levels inclusive of level IV were in the CTV, while the extended "U"-NC was chosen when at most surgical level III was in the CTV. Measurements to obtain relocation accuracy were taken in the face region and the neck region separately as the neck region is more susceptible to movement given the possibility of motion between vertebrae and between the Atlas More Details/axis and the occipital condyles. Separate measurements need to be taken at the level of the clavicles (and the van Herk margins were previously determined to be of the order of a 1 cm) given the movement at shoulder regions notwithstanding the restraint by the shoulder portion of the "S" type mask. These measurements did not vary whether or not the NC support was used (data not shown). The A-P margins were largest (0.78 cm) in the neck region for the "S" type mask [Table 1], both in the earlier (0.6 cm) or later (0.8 cm) measurements [Table 2], and seemed to reduce to 0.5 cm when the NC modifications were introduced. Also of note was that with progressive audits, C-C movements both in the head and neck region reduced from 0.7-0.8 to 0.3 cm with the better familiarity of technologists and also the use of NC modification [Table 2]. These results are comparable to the published literature. ,,,,,,,, The downstream effects of patient setup uncertainties are more pronounced with conformal techniques, especially IMRT, because of sharp dose gradients. These gradients are crucial as sparing of surrounding normal or critical tissues becomes possible. Therefore, apart from careful segmentation of gross and CTVs, there is a need of accurate PTV margins to overcome various uncertainties to deliver planned doses to tumor targets, as well as spare critical structures. Xing et al. reported that 3 mm error of the couch location in the A-P direction resulted in a 38% decrease of the minimal target dose or in a 41% increase of the minimal spinal cord dose. Prabhakar et al. also reported that dose to target volume decreases gradually with increase in setup error. The superior and inferior shifts play major role in tumor under-dosage. According to the authors, setup error of 3 mm along the posterior and lateral directions significantly affects the dose to the spinal cord. Similarly, setup error along lateral and anterior directions affects the dose to both parotids. They, therefore, emphasized the need to regularly study setup errors in each direction. We believe that this study would highlight the merit of serial audits but remind ourselves that all measurements taken historically were representative of that period only and cannot by themselves provide any measure of confidence that these can be automatically reproduced in future unless pursued with a similar degree of vigor and motivation of the treating teams involved. Grégoire V, Levendag P, Ang KK, Bernier J, Braaksma M, Budach V, et al. CT-based delineation of lymph node levels and related CTVs in the node-negative neck: DAHANCA, EORTC, GORTEC, NCIC, RTOG consensus guidelines. Radiother Oncol 2003;69:227-36. Levendag P, Braaksma M, Coche E, van Der Est H, Hamoir M, Muller K, et al. Rotterdam and Brussels CT-based neck nodal delineation compared with the surgical levels as defined by the American Academy of Otolaryngology-Head and Neck Surgery. Int J Radiat Oncol Biol Phys 2004;58:113-23. Apisarnthanarax S, Elliott DD, El-Naggar AK, Asper JA, Blanco A, Ang KK, et al. Determining optimal clinical target volume margins in head-and-neck cancer based on microscopic extracapsular extension of metastatic neck nodes. Int J Radiat Oncol Biol Phys 2006;64:678-83. Grégoire V, Eisbruch A, Hamoir M, Levendag P. Proposal for the delineation of the nodal CTV in the node-positive and the post-operative neck. Radiother Oncol 2006;79:15-20. Bayoumi Y, Al-Amro A, Moniem RA, Sohaibani I, Al-Hanafy O, Alawadi AS, et al. Assessment of three-dimensional set-up errors in head and neck cancer patients treated by intensity modulated radiotherapy using electronic portal imaging device. Gulf J Oncolog 2009;6:35-40. Humphreys M, Guerrero Urbano MT, Mubata C, Miles E, Harrington KJ, Bidmead M, et al. Assessment of a customised immobilisation system for head and neck IMRT using electronic portal imaging. Radiother Oncol 2005;77:39-44. Strbac B, Jokic VS. 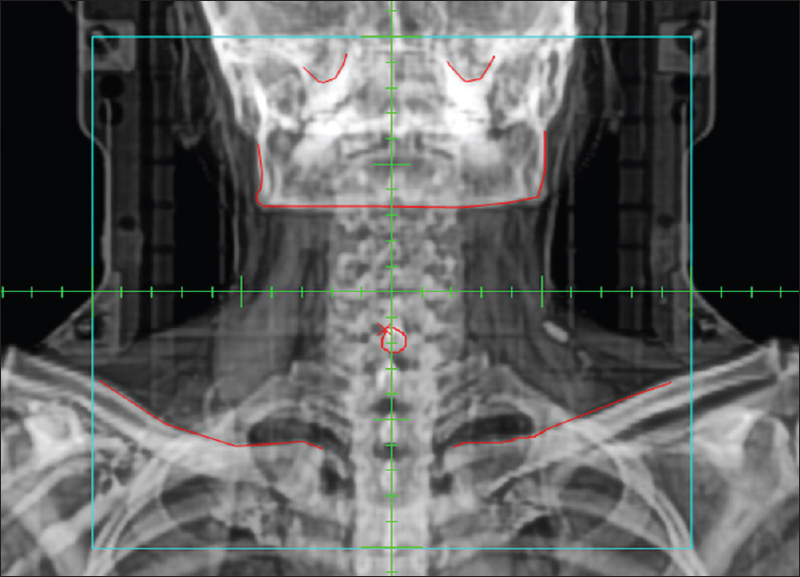 Evaluation of set-up errors in head and neck radiotherapy using electronic portal imaging. Phys Med 2013;29:531-6. Astreinidou E, Bel A, Raaijmakers CP, Terhaard CH, Lagendijk JJ. Adequate margins for random setup uncertainties in head-and-neck IMRT. Int J Radiat Oncol Biol Phys 2005;61:938-44. Chen AM, Farwell DG, Luu Q, Donald PJ, Perks J, Purdy JA. Evaluation of the planning target volume in the treatment of head and neck cancer with intensity-modulated radiotherapy: What is the appropriate expansion margin in the setting of daily image guidance? Int J Radiat Oncol Biol Phys 2011;81:943-9. Suzuki M, Nishimura Y, Nakamatsu K, Okumura M, Hashiba H, Koike R, et al. Analysis of interfractional set-up errors and intrafractional organ motions during IMRT for head and neck tumors to define an appropriate planning target volume (PTV)- and planning organs at risk volume (PRV)-margins. Radiother Oncol 2006;78:283-90. Naiyanet N, Oonsiri S, Lertbutsayanukul C, Suriyapee S. Measurements of patient's setup variation in intensity-modulated radiation therapy of head and neck cancer using electronic portal imaging device. Biomed Imaging Interv J 2007;3:e30. Gupta T, Chopra S, Kadam A, Agarwal JP, Devi PR, Ghosh-Laskar S, et al. Assessment of three-dimensional set-up errors in conventional head and neck radiotherapy using electronic portal imaging device. Radiat Oncol 2007;2:44. Ratondo RL, Sultanem K, Lavoie I, Skelly J, Raymond L. To compare the setup accuracy, comfort level, and setup time of two immobilization systems used in head-and-neck radiotherapy. Int J Radiat Oncol Biol Phys 2008;70:1389-96. Xing L, Lin Z, Donaldson SS, Le QT, Tate D, Goffinet DR, et al. Dosimetric effects of patient displacement and collimator and gantry angle misalignment on intensity modulated radiation therapy. Radiother Oncol 2000;56:97-108. Prabhakar R, Laviraj MA, Haresh KP, Julka PK, Rath GK. Impact of patient setup error in the treatment of head and neck cancer with intensity modulated radiation therapy. Phys Med 2010;26:26-33. Bentel GC, Marks LB, Hendren K, Brizel DM. 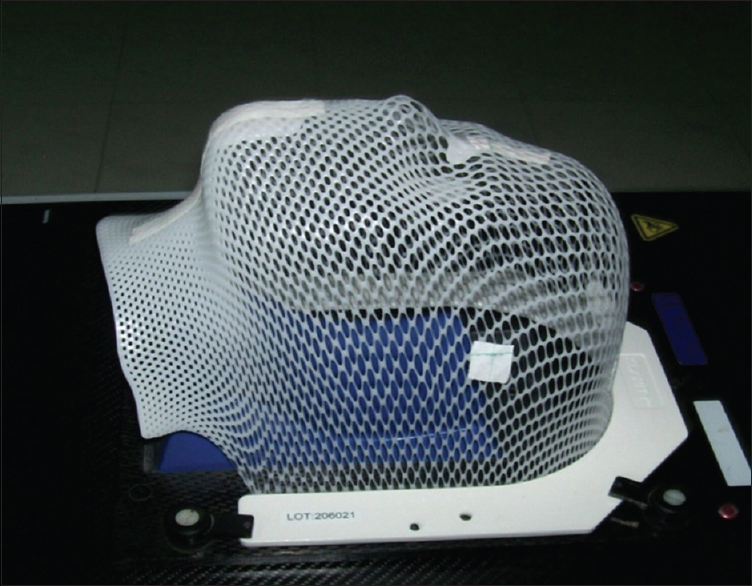 Comparison of two head and neck immobilization systems. Int J Radiat Oncol Biol Phys 1997;38:867-73.